On November 24, 2008 the Advisory Committee on Heritable Disorders in Newborns and Children held their sixteenth meeting. This meeting was done via WEBCAST and I had the opportunity to speak to the committee during the Public Comments section. At that time I read our personal story and experience with SCID and shared with the committee why I feel this inheritable disease should be added to the committees recommended uniform newborn screening panel. The committee did not make a decision during the last meeting and plans to have further discussions along with a vote during their February 26th & 27th meetings in Bethesda, MD. My name is Melissa Bornheimer. 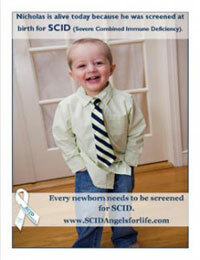 My son Dawson was the baby that was born in Wisconsin who’s life was saved because of the SCID newborn screening. He will be turning 3 in June and is doing absolutely wonderful! If there is ever anything that you guys need help with please don’t hesitate to ask. Wisconsin is up in arms with our new Governer and there is talk that our newborn screening for SCID could actually get cut because of budget issues. We are putting together a task force to try to nip this in the bud. So far there is no news yet….so we wait. I am always looking for any way that I can be a help, so again, if you ever need anything please let me know. 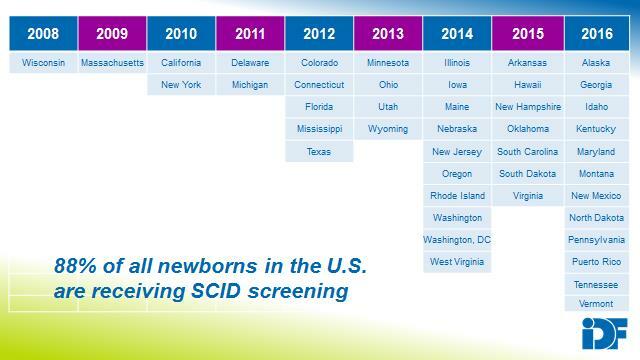 I’m sorry to hear that your baby boy will be born with SCID. I know how scared you must be feeling right now, as I felt the same way. Please know you are not alone! Knowledge is power and you are doing the right thing by gaining as much right now as you can. Please feel free to email me at Heather@SCIDangelsforlife.com anytime and we can “talk” further.